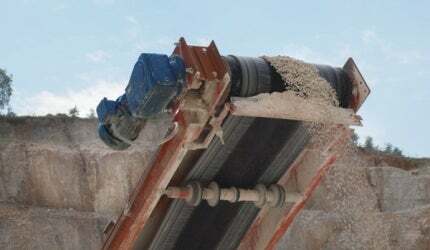 For short and long-distance conveyor systems, mill and rotary kiln drives, as well as thickener drives, NORD DRIVESYSTEMS provides the very latest energy-efficient drive solutions for every process stage in the mining industry. NORD industrial gear units can master any challenge. For more than 45 years, NORD DRIVESYSTEMS has been at home in a wide variety of industries. Its drive components and systems are essential wherever things need to be moved, as every movement needs a drive system that is as efficient and reliable as possible. Because of this, NORD DRIVESYSTEMS offers a complete range of mechanical, electrical and electronic drive technology from a single source, from motors and gear units to central and decentralised control technology. NORD DRIVESYSTEMS’ drive solutions are based on the principle of the function pyramid: motors, drives and gears are just as much components as the extensive range of system modules, such as planning, project management, installation and service. NORD DRIVESYSTEMS produces helical, parallel shaft, bevel gear and worm gear units. The UNICASE concept is a closed housing, which encloses all the elements of the gear unit and is milled from a solid block of steel or aluminium. NORD is the only manufacturer that produces modular industrial gear units with an output torque of 242,000Nm in a one-piece UNICASE housing. NORD DRIVESYSTEMS plans and delivers reliable, low-maintenance drive components for the entire drive chain, including electric motors, motor rockers, couplings, brakes, back stops and Taconite seals, as well as heating and / or cooling. Mineral-based materials are essential for sustainable building. However, the mining industry consists of sophisticated processes whose individual stages require a great deal of energy. This makes energy a large cost factor for the industry. The NORDBLOC gear unit offers foot or flange mounting, die-cast UNICASE aluminium housing in five sizes and industry-standard dimensions. The two-stage bevel gear drive unit has up to 97% efficiency and offers considerable customisation: face-mounted, foot or flange-mounted versions are available, and it can have a hollow or solid shaft. It has a UNICASE design and offers an alternative to worm gear units. The helical worm gear unit is available in face-mounted, foot or flange-mounted versions; it can have a hollow or solid shaft and has the UNICASE design. The SK 200E frequency inverter is designed for field installation or assembly directly onto the motor, and offers costs savings in design, installation and commissioning compared with the classic cabinet installations. With frequency inverters from the SK 500E series, NORD DRIVESYSTEMS provides intelligent, cost-effective drive solutions with graduated levels of equipment, which are fully compatible with machinery in their power range, connection voltage and size. In an extremely demanding construction project in the Swiss Alps, large chambers are being excavated to form the new expanded underground centre of a pumped storage hydroelectric power station that will increase its present power output from 480MW to 1,480MW.